Hello, and welcome to Almaden Country Day School and to the Parents’ Service Auxiliary, or PSA. The PSA is comprised of parents, and as co-presidents of the PSA and parents of ACDS students, we are happy to lead an organization that is key to fostering community life here at ACDS. Our events and services develop camaraderie among parents, staff, and students — the entire ACDS community. For families, we provide opportunities to socialize at special events such as the Pumpkin Carving Festival. For teachers and staff, we build morale with teacher luncheons and the Holiday Staff Celebration. Among students, we develop community spirit through parties and events, such as 2nd grade’s Pioneer Day or the middle school socials. 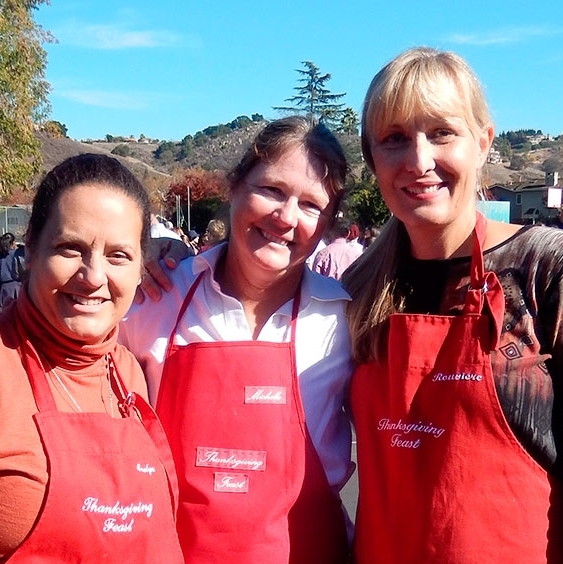 We bring the entire school together at our favorite event, the Thanksgiving Feast, when we organize and assist students and staff in cooking a meal that’s served on the blacktop to 500 people. And finally, we bring everyone together — students, staff, and families — to events that everyone can enjoy, including the Lemonade Party, the Fun Run, Sports’ Day, and ASSETS. The whole purpose of the PSA is to build community. If you’re new to Almaden Country Day School, please join us at these events and please help to make them happen. Choose your favorites and get involved. You’ll find warm smiles, lots of dedicated parents and staff, and a lot of appreciative kids. If you have have any questions or are looking for ways to get involved, seek us out or any of the other PSA board members. We’ll be visible at Back to School events in our bright red shirts. We love that our role as PSA co-presidents is helping people find ways to organize and implement dozens of events and activities for ACDS students, parents and staff. Thanks in advance for making all this happen, and for helping to build our Almaden Country Day School community.